Your hair in your 20s may look different than it will in your 40s. Here's why, what it says about your health and what you can do about it. 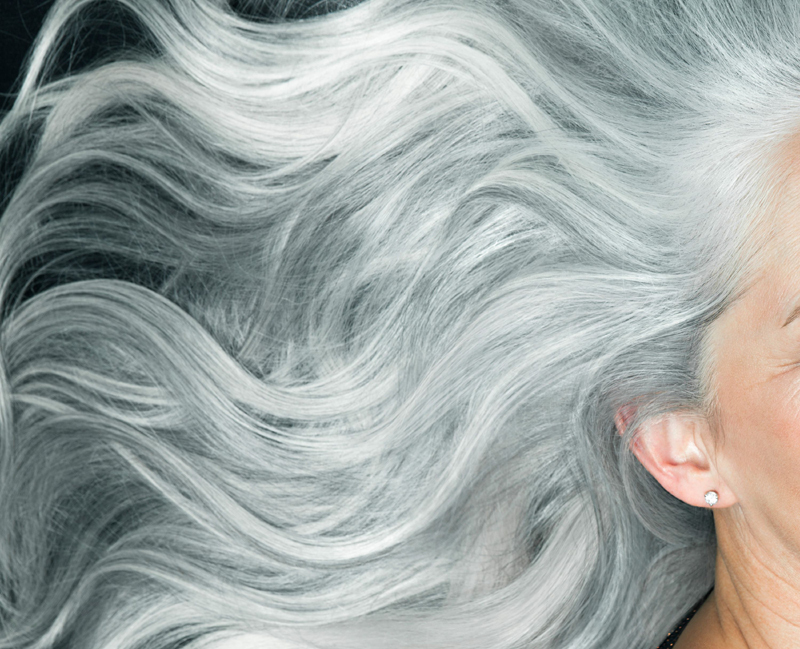 As women get older, our bodies start changing, and our hair is no exception. Many women notice differences in their hair as the years pass, ranging from changes in texture to color to thickness. But what’s a completely normal part of aging, and what is the signal of something more serious? We spoke with some hair care experts to find out why these changes happen and what we can do to improve our hair health through the decades. Given that hair loss may be the most alarming change you’re noticing as you age, we’re going to start there. First, it’s important to realize you aren’t the only one noticing a change in your hair. Angelo David Pisacreta, owner of Angelo David Salon in New York City and thinning hair specialist, has met with thousands of men and women who have experienced hair loss issues and tells SheKnows that around half of women experience some sort of hair loss by age 50. But how much hair is too much to lose? Dr. Dominic Burg, chief scientist at évolis, reminds us it’s perfectly normal to lose 100 hairs in a day, but when the growth period becomes too short and hair falls out too quickly, you may start to notice excess shedding. Other warning signs of thinning hair according to Burg are a widening part, a ponytail that feels noticeably thinner or extra hair in your hairbrush. Some women may notice they can’t grow hair past a certain length — usually the shoulders, Burg tells SheKnows. If this is the case, it means you are in the midst of a short growth phase, meaning your hair follicles aren’t working at full capacity, he says. So a little hair loss is normal, but why does it — along with the textural changes to our hair — happen in the first place? According to Pisacreta, these changes can be genetic, but your diet, lifestyle and how you treat your hair are factors as well. Along the same lines, Burg explains changes in hormone levels play a big role, with pregnancy, contraceptive medication and menopause all potentially affecting your hair cycle. If you find yourself changing up your diet a lot, Burg says that could be another reason for changes in your hair. In order to have the healthiest hair possible, he says to make sure you eat plenty of the B vitamins as well as biotin, zinc, iron and vitamin E.
And of course, stress can impact your hair health and quality. Burg explains that extreme stress or illness can force your body to slow down hair growth in order to favor the function of your other organs. Hair will generally be at its best in the early 20s, says Burg, because “hair shafts are thick and cuticles are tight.” Women may see changes if they are stressed, extreme dieting or using contraception. Many women begin a family in their 30s, and pregnancy, childbirth and breastfeeding change the hormones in the body, says Burg, which can profoundly affect the hair cycle, leading to excess shedding and hair thinning. “Pregnancy also affects the oil glands that lubricate and moisturize hair, with hair becoming more lustrous and beautiful during pregnancy followed by a big change after childbirth where hair becomes dull and more brittle,” he adds. Many women find themselves professionally and personally busy in their 40s, as family and careers compete for time, Burg notes. As a result, many feel more stress and aren’t taking care of themselves, which in turn affects their hair. Hair shafts also become more brittle and prone to breakage in your 40s, Burg says. Many women in their 40s color their hair regularly, which can damage and weaken the hair further, he adds. Many women begin menopause in their 50s which leads to having a shorter hair cycle, says Burg. Some people are completely gray by this point, and Burg explains their hair is more brittle because a person’s melanocytes have disappeared. By now, menopause is typically complete, Burg says, and that means many women will see a drop in estrogen and a rise in testosterone. “Testosterone can affect women’s follicles in the same way as in some men,” he adds, noting that by their 60s, women’s hair becomes even more brittle, which is why so many this age opt for shorter hairstyles. Given how stress can play a role in our hair growth, Pisacreta says we should be doing whatever we can to keep our stress levels down. As far as caring for your hair, he recommends only washing it every three to four days, as overwashing could strip your hair of natural oils it needs and add to hair loss. Exercising boosts your metabolism, and Burg says that can help in hair growth as well. He also recommends avoiding harsh chemical treatments, and if you are wearing weaves or extensions, you must make sure they aren’t too heavy, as they can lead to hair follicle death. Chances are whatever changes your hair is going through as you age are completely normal, and like most other aspects of our health, eating well, exercising and keeping stress down is your best bet.